How can I earn money with SlideJoy? With SlideJoy you don’t have to do anything. Yeah, really. Nothing to do. You install it and you earn money.It justs changes your lockscreen on your mobile phone and shows you news and advertisments. You don’t even have to read or watch them. You can slide to unlock your phone and then you can use your phone like you normally would. Nothing changes for you. If you use it, you get Carats daily. 1000 Carats are 1 Dollar, right now, I get around 15 Carats per day. Of course, that isn’t much, but you don’t need to do a thing. You just get a small passive income. I show you a picture of my phone from August, the 6th. 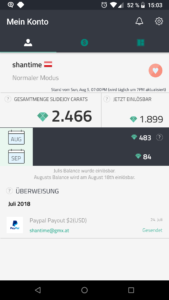 You can see there, that I already earned 84 Carats in august, without doing anything. Pure passive income. Btw, you DO NOT get more carats if you watch the ads. Also, you can use their offerwalls to earn Carats, but I don’t recommend them. My opinion about offerwalls (you can read it here) is not very good. I tried some offers. but I had to contact the support most of the time. Sometimes I got my carats, sometimes I got nothing. Currently I am not using any offers from their offerwalls at all, I just earn money with the app. Slidejoy also offers a so called “hero mode”. If you activate it, your earned money gets automatically sent to a charity. If you want to do something good, feel free to use this modus. Although I don’t use it, because if I support a charity, I want to decide which charity I support. But still, it’s a good thing that such a thing is included. Should I be honest? I have no clue. SlideJoy offers to option to send an invite with your referral link per mail to other people, but I can’t find your reward for it. I searched a lot, but noone seems to know for sure what you get for referring people. As soon as I find something, I will update this article! Does SlideJoy really pay me? Yeah, SlideJoy is legit and really pays you. I already got a payment, as you can see here. You get the Carats of a whole month in the middle of the next month. That means, around August, the 14., I get the carats from July to my SlideJoy account. As soon as you have 2040 carats, you can cash out 2 Dollars. You can either cash out through Paypal or with a credit card. The fees for Paypal are cheaper, that’s why you need less Carats to cash out through Paypal. SlideJoy is a great app. I can recommend it to everyone. You don’t have to do anything and still earn money with it. I earn around 50 Cent per month. Of course, you won’t get rich, but you are able to earn a few Dollars with it. Especially because it’s a pure passive income. If someone insists on having his own lockscreen, he should’t use it, but everyone else should really use it. If you want to download the app now, feel free to send me a Mail, I will send you a link. The link does not work forever, that’s why I can’t link it directly here. Of course, you can also check the Google Play Store for SlideJoy and download it there.